Pirates who seized a Ukrainian ship off the coast of Somalia have reportedly demanded a ransom of $35m (£19m) to release the vessel and its crew. The pirates also warned against any attempt to rescue the crew or cargo of the MV Faina, which is carrying 33 T-72 battle tanks destined for Kenya. But the Kenyan government later denied it had been issued with ransom demands. A Russian Navy vessel is heading to the region and the US has said it is also monitoring developments in the area. Ethiopia's Prime Minister, Meles Zenawi, said he was concerned by the seizure of the military supplies on board the Ukrainian ship. "They could be used to destabilise the region, and the whole situation on the high seas is a matter of great concern for all of us," he told reporters in New York before a meeting with US Secretary of State Condoleezza Rice. "We very much hope the international community will respond." The official Egyptian news agency, Mena, meanwhile has said that an Egyptian ship with 25 crew, which was hijacked by pirates earlier this month off the coast of Somalia's semi-autonomous region of Puntland, had been freed. A local official in northern Somalia said a Japanese cargo vessel had also been released after a ransom was paid. In an interview with the BBC, one of the pirates, Januna Ali Jama, claiming to be speaking on their behalf, said they were prepared to negotiate with the Kenyan government, but would not release MV Faina unless the ransom was paid. "We are warning France and others who are thinking of carrying out a rescue that we have the power to reach them wherever they are," he said. "We are demanding a ransom of at least $35m." But later in a tersely-worded statement, a spokesman for the Kenyan government said they had not received any credible demands for a ransom to release the ship. He went on to say that the government would not negotiate with what it called international criminals, pirates and terrorists, and said efforts to recover the hijacked ship and its cargo would continue. The BBC's Karen Allen in Nairobi says there is growing international concern for the fate of the Ukrainian vessel, which went missing in what are considered some of the world's most dangerous waters. There are unconfirmed reports, our correspondent says, that it is currently being steered by the pirates towards ports just north of the Somali capital, Mogadishu - an area controlled by Islamist militants. On Friday, Ukrainian Defence Minister Yury Yekhanurov confirmed that 33 Russian T-72 tanks and "a substantial quantity of ammunition" were aboard the MV Faina. 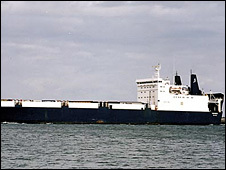 Ukraine's foreign ministry said the ship had a crew of 21 and was sailing towards the Kenyan port of Mombasa. The ship's captain had reported being surrounded by three boats of armed men on Thursday afternoon, it said. Earlier reports suggested that the cargo had been destined for south Sudan, but Kenyan government spokesman Alfred Mutua confirmed the tanks were heading to Kenya. "The cargo in the ship includes military hardware such as tanks and an assortment of spare parts for use by different branches of the Kenyan military," he said. Security analyst Knox Chitiyo told the BBC the latest incident showed the waters off Somalia's coast had become a "global security problem". "Piracy has become big business and there seems to be no concerted response to the problem," said Mr Chitiyo, from the London-based Royal United Services Institute. Authorities in Puntland say they are powerless to confront the pirates, who regularly hold ships for ransom at the port of Eyl. 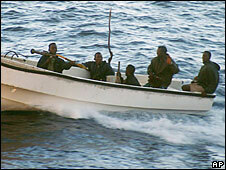 Senior UN officials estimate the ransoms pirates earn from hijacking ships exceed $100m (£54m) a year. Pirate "mother ships" travel far out to sea and launch smaller boats to attack passing vessels, sometimes using rocket-propelled grenades. Last week, France circulated a draft UN resolution urging states to deploy naval vessels and aircraft to combat such piracy. France, which has troops in nearby Djibouti and also participates in a multi-national naval force patrol in the area, has intervened twice to release French sailors kidnapped by pirates. Commandos freed two people whose boat was hijacked in the Gulf of Aden earlier this month and in April, six arrested pirates were handed over to the French authorities for trial. Russia announced on Friday it would start carrying out regular anti-piracy patrols in the waters off Somalia to protect Russian citizens and ships. A warship was sent to the area earlier this week.